Voting is easy. Sign up here and then vote every day. As of this morning when I cast my daily vote, Cody is ranked No. 10 out of 20 listings. You can also get updates and follow the voting action on Twitter, Facebook, Instagram and Pinterest. Historic structures are located throughout the town. One of Corrie’s favorites is the Irma Hotel, built by Buffalo Bill in 1902. 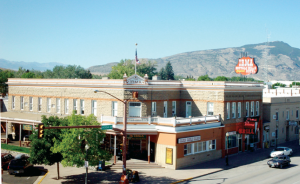 There are oh-so-many reasons that the town of Cody should win big in contest for the best historic small town. There’s our town founder and namesake Buffalo Bill Cody, of course. And all of the many famous attractions he built himself or inspired others to create. For example, the Irma Hotel, with its massive cherrywood bar that England’s Queen Victoria gifted to the frontiersman-turned-showman after he performed his Wild West Show in London. And the Buffalo Bill Dam, which the Colonel and a team of town leaders pushed to secure much-needed water for the town and nearby ranchers. You can still visit Pahaska Tepee and see where Buffalo Bill went to relax. And so much more. I plan to vote every morning when I pour my first cup of coffee so I don’t forget. It takes all of 10 seconds to cast a vote for Cody, and your vote could do a world of good for your favorite historic town. 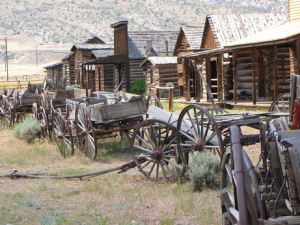 With more than 20 authentic cabins and other frontier buildings Old Trail Town/Museum of the West is another great place to experience the history of Cody Yellowstone. Until next time, I’m casting my vote and loving life here in Cody Yellowstone.